It is very common to share pictures with friends and family using email. Before we look at how it is done we will look at some general considerations that you must be aware of regardless of which email client and email provider you are using. Photos from digital cameras are large. My camera, for example, produces 2Mbyte jpeg image files, and is probably typical for a standard amateur camera. However higher quality camera can produce images with sizes of 7 to 16MB. Regardless of the file size produced by your camera, the fact remains that even a basic camera will produce large files sizes, as far as email is concerned. Most email providers limit email sizes to around 20MB. This equates to around 10 regular photos and around 2 high quality ones. So what do you do if you need to send a collection of photos? Send Using a File Sharing Service. Reducing the Photo file size will reduce the image quality and so you need to understand what the Photos will be used for by the recipient. Services like Facebook do this automatically when you upload your photos. If the recipient needs to print the Photos then reducing the size isn’t recommend. However if the recipient only needs to view the photos on their tablet/computer then you can reduce the file size considerably. I use the Microsoft picture manager which comes with Microsoft Office. Here is a before and after screen shot of an image called Liverpool.jpg. Notice how it has been reduced from 2.5 Mbytes (from camera) to 235Kbytes, and the corresponding change in picture dimensions from 4000px wide to 1000px wide. To do that open the image with picture manager, and then click the compress link in the lower right. Then use the document setting to reduce the size of the image. This setting will give the final image good enough quality when viewed as a full size image. If you don’t have Microsoft Picture manager available there are many excellent free image reducers available. Thumbnail creator by folkes software– You can create images of any size not just thumbnails. These programs also have the advantage that they work in batch mode which means you can resize multiple pictures at once. 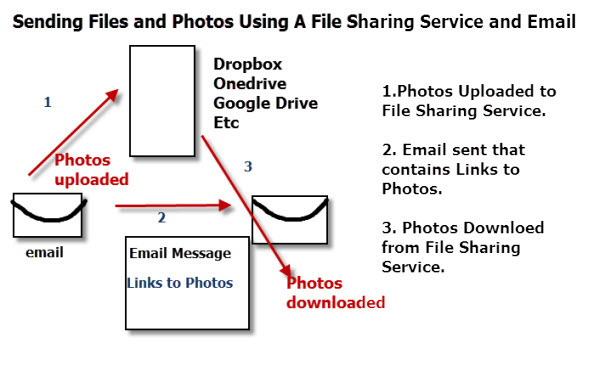 The idea used here is that the photos/attachments are not sent by email, but are instead uploaded to a file sharing service, and the recipient receives a link via email to the photos. Using this link the recipient can download the photos to his own PC/Tablet. If they leave them stored on the File Sharing Service they may become inaccessible after a certain period. If you use Google Gmail then Use Google Drive, and Microsoft Outlook use Onedrive. However you can use Google drive or Onedrive with Yahoo mail and Dropbox with Gmail and outlook.com. Rather than add pictures are attachments they can be embedded within the email message. Because they are part of the message they cannot easily be saved by the person receiving them, and so this method isn’t normally used for sharing photos with friends and family. It is however a very good way of sharing thumbnails images. When done this way the larger images are added as an attachment or sent via File sharing, and a thumbnail image is added inside the message. The windows live mail client does this automatically when you send a photo album. The Windows live mail client also sends pictures using onedrive rather than as an attachment.